Male cardinals are among the the most familiar and distinctive birds in North America and are a very common inhabitant of sycamore woods. 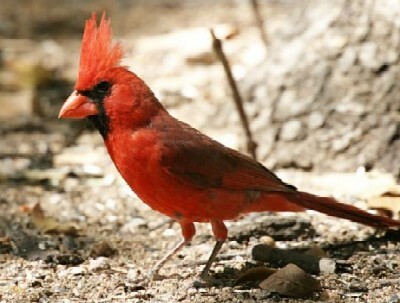 The plumage is almost entirely bright red, the head sports a tall crest and a heavy almost red bill for cracking seeds. Females on the other hand are gray and salmon color and in Arizona's sycamore woodlands can be confused with the Pyrrhuloxia. The pyrrhuloxia can be readily distinguished, however, by its yellow bill. During the winter months cardinals feed mostly on seeds and fruit. The orange berries of Net Leaf Hackberry and Canyon Grape, for example, are heavily used. In summer cardinals depend on an abundance of insect prey to feed their developing young.